with friends Watermelon and French Fries. 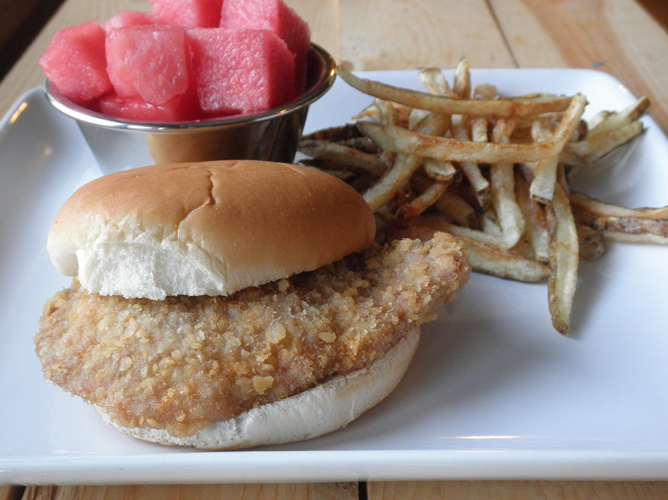 Here is a recipe for a classic Midwestern favorite: pork tenderloin. Most Iowans love all things pork, which is really at the heart of why I started this blog. (See Pulled Pork Cinnamon Roll recipe.) I'd never had a fried pork tenderloin sandwich until I moved here to Iowa. And I don't even think I ate one until I made it following this recipe. I have only eaten a few others, and I think this is still my favorite. Probably because it's fresh. The meat here turns out moist on the inside, crisp on the outside, and just plain tasty. I also love this recipe because it is so simple: pound out the meat, dip in bouillon, dip in crackers, and fry. One pork tenderloin makes enough to serve five or six people. I always have leftovers, which do get eaten. Mix the hot water and chicken base/bouillon in a medium bowl or square baking dish. Cut the pork tenderloin into 1-inch slices. Place one piece of pork at a time between two medium pieces of plastic wrap and pound with a meat tenderizing mallet until it is about 1/4 inch thick. Place cracker crumbs into another flat dish or pan, like a pie plate. Heat about 1 1/2 inches of canola oil in a frying pan over medium high heat (heat to 375 degrees Fahrenheit). Dip each piece of meat in chicken broth mixture and then lay it down in the cracker meal, coating both sides well. Carefully place into hot oil. If you have a wide pan, you can fit 2-3 pieces of pork at a time into the pan. Turn after about 2 minutes. Fry until golden brown. 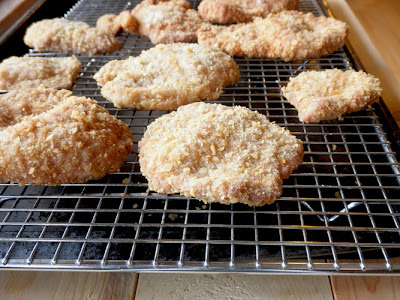 Move to a cooling rack lined with a single layer of paper towels. Serve on hamburger buns with your choice of condiments. Makes about 7 or 8 sandwiches. This is a full pork tenderloin all fried up.